Press Release: December 29, 2014 By Majestic Raven Entertainment - What is a Rougarou? A Rougarou (pronounced Roo gah Roo) is a legendary half-man half-beast werewolf-like creature from Louisiana folklore known for its ferociousness. Undefeated welterweight and decorated amateur Prospect Regis 'Rougarou' Prograis is scheduled to bring his fight on the Ivan Redcak ShoBox undercard this January 2015. 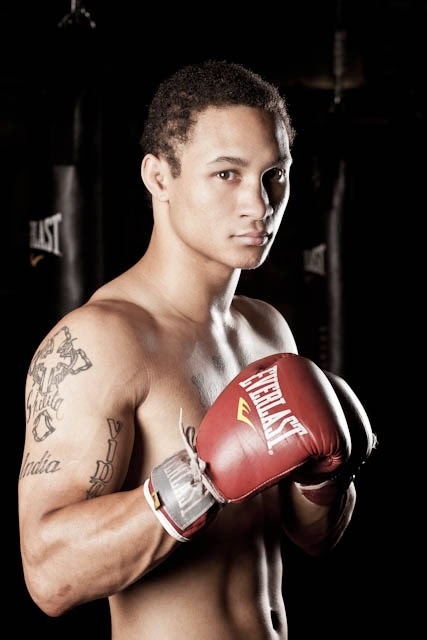 Prograis giving the moniker due to his power punching style looks to bring excitement to boxing fans in Cabazon, CA. Prograis who will be making his California debut is excited for the opportunity. "I knew that it would probably be the last time for me to fight so close to home, so I wanted to give my family, friends, and fans something to remember me by. ", replied Regis when questioned about his previous fight in Opelousas, LA which only a couple of hours from his hometown in New Orleans. "I plan on gaining some California fans on January 9. I like to please the crowd." The card takes place Friday, January 9, 2015. DiBella Entertainment will stage an exciting night of championship boxing at the Morongo Casino Resort & Spa in Cabazon, California. There is no doubt that one of the most interesting storylines in the current landscape of the Heavyweight division is unified IBF/WBO/WBA/IBO Heavyweight world champion Wladimir Klitschko’s march towards Boxing history. A consistent topic of discussion following a Klitschko title defense over the years has been who may come along that can provide a legitimate challenge to the champion. This topic did include Wladimir’s brother Vitali for several years as the two brothers ruled over the Heavyweight division with two iron fists. With Vitali now retired, the discussion has centered on who can provide a legitimate challenge to Wladimir. This observer has consistently analyzed who may be considered a future opponent for Wladimir as he has continued to compile successful title defenses. Some readers may recall following Wladimir’s fifth round knockout win over top contender Kubrat Pulev last month that I stated that I only saw two realistic options for Klitschko as 2015 approaches as potential opponents. Those were to face the winner of the recent rematch between top contenders Tyson Fury and Dereck Chisora, or to face the winner of the upcoming WBC championship fight between champion Bermane Stiverne and top contender Deontay Wilder. Readers may also recall statements I made following Tyson Fury’s victory over Dereck Chisora in their rematch in stating my opinion that Fury as the only fighter currently who has a mandatory title shot to challenge Klitschko, earning the number one ranking in the WBO Heavyweight ratings with his victory over Chisora should be next for Klitschko. Although my opinion has not changed, another fighter may have emerged as a potential Klitschko opponent. Former two-division world champion Antonio Tarver. Tarver, the multi-time Light-Heavyweight champion, who went on to briefly hold a world title in the Cruiserweight division has been in the midst of a comeback as a Heavyweight. Tarver returned to the ring in November of last year after testing positive for a banned substance following his IBO Cruiserweight title defense against Lateef Kayode in June 2012 to score a fourth round knockout of veteran Mike Sheppared. Tarver’s comeback however, was briefly put on hold as he suffered an injury to his left thumb while in training for his scheduled September bout with Heavyweight contender and Wladimir Klitschko trainer Johnathon Banks. The injury, which caused the temporary cancellation of the fight would result in it being eventually is scheduled for December 11th in Temecula, California. The primary question that I had in my mind when the forty-six year old Tarver entered the ring to face Banks was whether ring rust would be a factor. Most would say of course that a necessity for a fighter as they begin a comeback would be for that fighter to stay as active as possible. This would be especially crucial for a fighter who is forty-six years old. Ring rust however, would not be a factor as the fight was fought at a tactical pace, which frankly at times resembled a sparring session. What did stand out was Tarver’s ability to be effective with his offense. Neither fighter threw many punches at one time for much of this fight, but Tarver was able to be more effective when he did let his hands go, particularly when he was able to counter Banks’ offense with his left hook. Tarver was also able to control the tempo of this fight. Tarver would bring an end to the fight in round seven when he dropped Banks with a combination. Banks to his credit did get up from the knockdown, but could not fend off Tarver’s follow-up barrage which resulted in the fight being stopped by Referee Jack Reiss. Although this fight did not ultimately provide much of a test for Tarver in his first fight following a year layoff, Tarver’s timing and accuracy throughout this fight was impressive and it did serve the purpose of resuming his comeback. It will be interesting however, to see where Tarver goes from here. Although Tarver is rated number ten in the world in the current WBA Heavyweight ratings, much of the division is in limbo as 2015 nears. It is unclear as of this writing as to who Wladimir Klitschko might face next. Although this observer believes that Klitschko should face Tyson Fury next, contenders such as Bryant Jennings, Vyacheslav Glazkov, and former WBO Heavyweight world champion Shannon Briggs might all be considered options for Klitschko. One might argue that Tarver may enter the realm of discussion of potential Klitschko opponents per not only his stoppage win over Klitschko’s trainer Johnathon Banks, but also due to the name recognition that Tarver has. It is a possibility that Tarver could receive title shot per his name recognition value and the intriguing storyline of him trying to win a world title in the Heavyweight division at forty-six years old in attempting to surpass George Foreman as the oldest fighter in the division’s history to win a world title. Although one should not dismiss the possibility of Tarver getting an opportunity against Klitschko at some point, this observer believes that it is of more importance that Tarver remain active while attempting to secure a fight with Klitschko. One has to remember that Tarver is forty-six years old and I believe that if he remains active and is able to fight more frequently that it will keep his name out there and if he continues to win, the idea of him facing Klitschko may become more relevant. There are certainly fighters in the Heavyweight division who are looking to accomplish the same thing that Tarver is by looking to secure an opportunity to fight Wladimir Klitschko and would likely welcome an opportunity to face Tarver due to his name recognition value and look at a fight with him as a potential vehicle to springboard themselves into a potential title fight. Fighters such as David Price, Lucas Browne, Alexander Povetkin, and Vyacheslav Glazkov, just to name a few could each provide an interesting fight stylistically for Tarver. If Tarver were to be successful against either of these fighters it would obviously elevate him in the Heavyweight rankings. Wladimir Klitschko has for the moment fulfilled his mandatory title defense obligations in each of the sanctioning bodies, whose titles Klitschko currently holds. Some may believe that Klitschko wants to avenge his trainer’s defeat at the hands of Tarver. This observer does not think that a fight between Klitschko and Tarver will happen in the near future. If Tarver does remain active and continues to win however, and Klitschko remains at the top of the Heavyweight division it does have the makings of what would be an interesting fight. It remains to be seen if Tarver can still become a top contender. One of the most interesting storylines that has emerged in the sport of Boxing in the last couple years has been the emergence of unified WBA/IBO Middleweight world champion Gennady Golovkin, who has earned a reputation as one of the sport’s premier knockout artists. As Golovkin has carved out what this observer has called a path of destruction through the Middleweight division scoring eighteen consecutive knockouts and successfully defending his world title twelve times, a question that has emerged is who may be able to give Golovkin a significant test. This observer has stated that I believe the time has come for Golovkin to face fighters that most would consider stars in and around the Middleweight division. Although most would say that the biggest star in the Middleweight division currently would be Miguel Cotto, the current WBC world champion. A fight between Golovkin and Cotto does not appear as a fight that will take place in the near future. Cotto appears to be nearing a fight against Saul Alvarez and Golovkin is scheduled to face former world title challenger Martin Murray on February 21, 2015. With Golovkin taking on Murray and with Cotto-Alvarez seemingly on the horizon, some may wonder what may be in store for the rest of the Middleweight division. On December 6th at the Barclays Center in Brooklyn, New York top Middleweight contender and North American Boxing Federation (NABF) champion David Lemieux made his United States debut by scoring a tenth round stoppage of former world title challenger and current BKB: Big Knockout Boxing Middleweight world champion Gabriel Rosado in a fight fought under traditional Boxing rules. Lemieux, who entered the fight with a record of 32-2, with 30 Knockouts showcased his power in this fight using a well-balanced attack to the body and head of Rosado. Although Lemieux had a clear advantage in punching power over the always “Game” Rosado, Rosado once again showed his mettle by fighting much of the fight with a severely swollen left eye. What impressed me about Lemieux in this fight along with his attack of Rosado was he showed the ability to take a punch and keep coming forward when Rosado was able to be effective periodically with his offense. Lemieux scored a knockdown of Rosado in round three and was able to maintain his consistent attack that ultimately earned him a stoppage win in the tenth round when the fight was stopped due to the swelling of Rosado’s left eye. Even though Rosado was outgunned in this fight, he showed the heart and determination that has earned him the respect of Boxing fans and experts alike. Despite having lost four of his last five bouts fought under the traditional Boxing format, this latest loss will not likely prevent Rosado from getting potential lucrative opportunities in the Middleweight division. One should also remember that Rosado does hold a world championship in BKB and although bouts fought under BKB rules and under the BKB format are not presently considered official by official Boxing record keepers, there is definitely potential for Rosado to establish himself as one of the stars of the entity known as Big Knockout Boxing if Rosado chooses to return to BKB to defend his title. Prior to this fight, I stated that it will be interesting to see what would be in store for the winner of this fight in a Middleweight division that is very deep where any of the top contenders could find themselves challenging for a world championship at any given time. Lemieux’s performance against Rosado was certainly one that was an attention grabber and will likely launch him into the discussion of potential challengers for Gennady Golovkin. With much of the top of the Middleweight division with fights involving world championships and uncertainty in regard to the status of International Boxing Federation’s (IBF) Middleweight world championship, the question coming out of this fight is what’s next for David Lemieux? One option could be for Lemieux, who is currently rated in the top ten of the WBC, IBF, and WBO Middleweight ratings to wait to fight the winner of the upcoming fight in February between Gennady Golovkin and Martin Murray. With some already touting Lemieux as a potential Golovkin opponent, should Golovkin successfully retain his title over Murray, it is quite possible that Lemieux would want to wait on the results of that fight before choosing what he wants to do next. If Lemieux however, does not want to wait on a potential shot at the winner of Golovkin-Murray, there are certainly other options that may be available to him. One such option could be to face the winner of this weekend’s vacant WBO world championship fight between top contenders Matt Korobov and Andy Lee. Although Billy Joe Saunders, who defeated Chris Eubank Jr. on November 29th is slated as the WBO’s mandatory challenger for the winner of Korobov and Lee, there have been circumstances in the past where fighters who have won vacant world titles have been allowed to make an elective title defense before facing their mandatory challenger. Whether or not an option for an elective title defense will be available to Korbov or Lee remains to be seen. If the winner of that fight is granted the opportunity to make an elective defense however, it would not surprise me if David Lemieux were considered as an opponent. Although Lemieux made his debut in the United States against Gabriel Rosado, it is important to remember that Lemieux has been able to establish a sizable fan base in his hometown of Montreal, Canada, which has become a hotbed for the sport. What should not be overlooked are the potential economic incentives that a fight with Lemieux in Canada can bring any of the champions who may be interested in fighting him. If a world championship fight is not in the immediate plans for David Lemieux. If he decides to take a fight against a top contender, fighters such as Curtis Stevens, undefeated former WBO champion Peter Quillin, and former multi-time Middleweight champion Felix Sturm could all be potential options. No matter what option David Lemieux takes for his next fight one thing remains clear. The Middleweight division will surely remain a topic of discussion for both Boxing fans and experts alike for some time. The one thing that has also become evident is David Lemieux has officially become a player in the division. Whether or not Lemieux will become one of the division’s central figures remains to be seen, but it will be interesting to see where he goes coming off of what was an impressive victory.